Knowing the number of calories you eat from sugar can help you when working to lose weight or when trying to control your blood sugar. If you regularly add sweeteners, such as granulated sugar or brown sugar, to foods or beverages, it's important to know how many calories this contributes to your daily intake. You can also compare the number of calories you're consuming from sugar to recommended guidelines for sugar intake. Measure the amount of sugar you are adding to your food or beverage to determine the total number of teaspoons. For reference -- one tablespoon equals 3 teaspoons and 1/8 cup is 6 teaspoons. One cube of sugar is about 1/2 teaspoon and a single sugar packet is about 2/3 teaspoon. 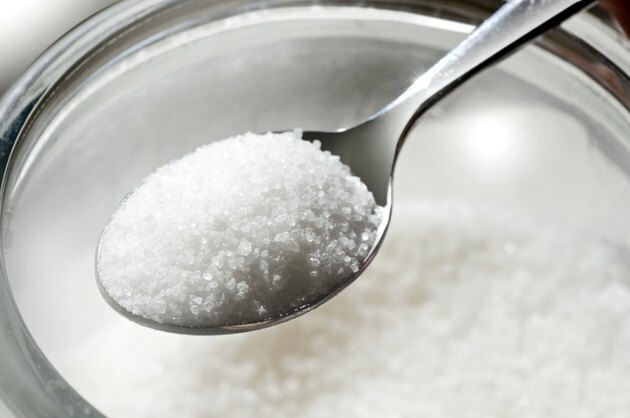 Multiply the number of teaspoons by 4 to get the total grams of sugar, because there are 4 grams of sugar per teaspoon of granulated sugar, according to the U.S. Department of Agriculture. Multiply the total grams of sugar from step 2 by four to get the total calories from sugar, because there are 4 calories per gram of sugar. For example, there are 32 calories in 8 grams of sugar, which equals 2 teaspoons. You can compare the calories from sugar you eat per day to the guidelines, recommended by the American Heart Association, which state that women should get no more than 100 calories per day from added sugar and men should get no more than 150 calories per day from sugar. Remember that many processed and packaged foods such as desserts, baked goods, candy and soda, contain added sugar, as well. Instead of eating foods with added sugar, choose whole foods with natural sweetness, such as fruit and milk, to help you get the greatest amount of nutrients per calorie. According to an article published in the journal "Circulation" in 2002, eating a high-sugar diet may lead to elevated triglyceride levels, poor blood sugar control, weight gain and a lack of vitamins and minerals in the diet. Do You Subtract Soluble and Insoluble Fiber When Getting Net Carbs?